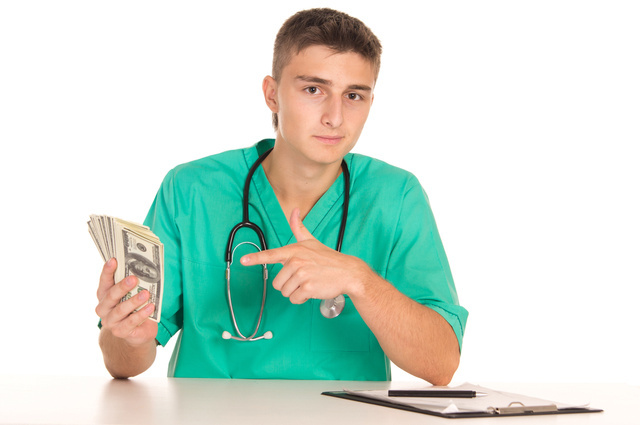 What's the welfare implication of overpaid doctors? That was your money, is now his money,and about to be his med school's money. Matt Yglesias attracted a weird amount of hate from conservatives yesterday over his post suggesting some doctors might be overpaid. The fact that it was conservatives who hated his argument is puzzling to me, because Yglesias's whole argument was, in principle, extremely conservative--he's advocating for supply-side reforms that would increase the supply of medical practitioners while reducing their cost. That's everything that conservatives claim to preach. In fact, the only possible way that might be considered anything but hard-core conservatism is the fact that it just happens to involve a modest amount of redistribution from extremely rich people (doctors) to less rich people (patients). Now, I'm broadly in favor of the things Yglesias argued for--in particular I would support policies to allow nurse practitioners and physician's assistants more autonomy for a wider range of services than at present. I'd also reform medical internships and residencies so that hospitals can train more doctors more cheaply without needing government subsidies to do so. However, I'm not as responsive to Yglesias's core argument that doctors are "overpaid." I think it helps to separate the two sides of this issue here: there are concerns of distribution of income, and concerns of efficiency. On the distribution of income, we may conclude that doctors get too big a slice of the national income, and everyone else gets too small a slice, and that therefore we should (if feasible given incentive effects) redistribute from the one to the other. Or we may decide quite the opposite--doctors work hard and save lives, and therefore deserve even more than the free market will give them. That's not what I believe, but it is an equally valid opinion. In this latter scenario, we'd want to institute policies that increase doctors' salaries, thereby redistributing from everyone else to doctors. Matt Yglesias points out that in many ways, this is exactly what we do. But that is all a totally separate issue from whether the market is efficient. The loss of efficiency that typically occurs when a price is above it's market-clearing level is not that it "costs" customers more money--that is just a matter of distribution. Actually, the welfare loss comes from the fact that at the higher price, some customers will under-utilize the good or service being sold. That is, what we should look for when considering the efficiency of high doctors' salaries is whether there are people who need medical services but are simply being priced out of the market. Under the ancien regime, that was certainly the case. People who did not have insurance policies with reasonably low deductibles were getting less than the optimal level of healthcare. But under Obamacare, in theory at least, everyone will have an insurance policy with a reasonably low deductible, which means that these people will now be able to get the optimal level of care, even though they are paying substantially more for it--through their insurance premiums--than they would in Yglesiasland. Indeed, many of the ways Yglesias mentions that doctors get subsidized happen in the form of lump-sum transfers from non-doctors to doctors (for example, tax exemption for employer health insurance premium contributions). By their nature, these lump-sum subsidies are not welfare reducing, even if they produce a less equable distribution of income, because they do not reduce healthcare utilization (in a world where everyone has insurance). For this reason, I am something of an agnostic when it comes to proposals to "control costs" by decreasing doctor's salaries. Not all of these kinds of proposals actually increase economic efficiency. Don't get me wrong, I'm all for redistributing from rich to poor, but I'm just fairly indifferent whether we do it that way versus just progressive taxation.